Another winter is reaching its conclusion now, as March rapidly heads towards April. As the calendar flips, the college basketball world will become more and more fixated on Indianapolis for the Final Four and the crowning of a new champion. With the bracket set and the field of 64 ready to go to war, it’s also a time for homers and amateur prognosticators to hit the Internet in a frenzy to engage in trash talking and, in some cases, excuse making. For the most part, it’s just a good time. There are few things I enjoy more than talking hoops and arguing for the superiority of my own team. As an East coaster though, there’s one phrase I’m really sick of hearing this time of the year: “The East coast bias." In the autumn and winter months, it seems like just the opposite. Fans of Eastern football conferences like the Big East and ACC whine about how much attention Notre Dame and teams from the Midwestern conferences get. Although geographically not an Eastern school, there were a lot of Big East people on the Cincinnati bandwagon, complaining about Texas’ bid to the national title when the Big East’s champion seemed just as deserving. And while both came from BCS Conferences and made strong cases for a spot, it was granted to Texas primarily because the media had ranked them higher before the season even started. The great thing about college basketball is that we don’t really have that problem. The best teams will all have their chance to make their claim to a championship. While some seemingly deserving teams usually get left out of the tournament, they’re rarely threats to win the title anyway. Even so though, there’s a lot of complaining about seeding-- that perhaps Kansas State or Ohio State deserved 1-seeds, or that Kansas was given a tougher road to the Final Four than Duke despite being the overall No. 1-seed (which is a completely legitimate argument). So why the apparent shift in geographical bias then? Is it even real, or is it just a difference in perception? It’s hard to say, but if the talking heads are all biased, I really doubt location has very much to do with it. The media probably does focus a lot more on Eastern basketball than it does the rest of the nation, but it’s for good reason. The fact is, the best basketball in the country has been played in the East the last decade or so and that’s really not even open for debate. Since 2000, eight of the ten national champions have come from the Big East, ACC or SEC (Duke, Maryland, Syracuse, UConn, North Carolina x2, and Florida x2). The Big Ten has produced one champion, Michigan State and the Big XII has one champion in Kansas. The Pac-10 has been shut out since Arizona won it all in 1997. The sports media is only biased towards two things; success and fan base size. 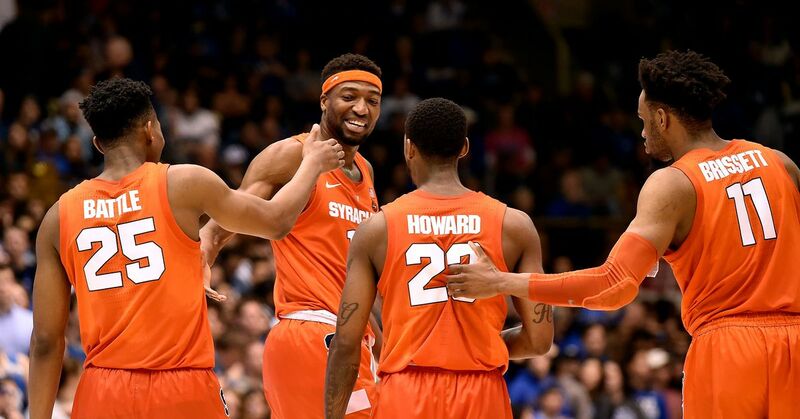 Using my hometown Orange as the example, Syracuse has received a lot of love from ESPN this season. They’ve done nothing but win all year and after getting off to a hot start, everyone took notice.It turned into one of the biggest storylines of the early season, because the Orange were noticeably absent from the Associated Press’ preseason poll, after losing Jonny Flynn, Paul Harris and Eric Devendorf. 28 wins later though, they’re a No. 1-seed in the Dance and a popular pick to reach the Final Four. I might add that they’re also a popular pick to lose in the Final Four to Midwestern power, Kansas. Where’s the bias here? The buzz about Syracuse’s title chances suffered a quick death the moment Jonny Flynn declared for the NBA Draft and they only got back into the media spotlight by winning more games than almost anybody else this year. If that’s bias, then there’s really no winning for the national media, because it would simply be defined as disagreeing with you as an individual and they just can’t appease everyone. It’s a term that gets thrown around way too much these days, because few people can concede that they might be wrong and anyone who suggests that they are has some sort of ulterior motive. If this is you though, don’t fret because if you really think that your team got the shaft, then they’ll get the opportunity to prove you right. This is why college basketball is far and away superior to college football. Even if you’re unhappy about your team’s seeding they will get the opportunity to prove, on the court, that they’re better than the number given to them. Personally, I believe that people whining about seeding for teams like Kansas State or Ohio State are biased themselves, because the resume’s don’t seem to support their cause. But, if they are as good as the Big Ten and XII fans say, then let them prove it by toppling the Eastern powers on their way to Indianapolis, the same way Syracuse carved through the best of the Big XII on their way to the championship in 2003.